This year marks Bethesda’s fourth E3 conference, and they sure know how to get fans excited beforehand. Prior to E3, Rage 2 and Fallout 76 had been confirmed. Rumors ran rampant for Fallout 76 itself, not to mention the yearly rumblings surrounding the next entry in the Elder Scrolls series. Did Bethesda’s conference adequately show off what’s coming up next? Let’s find out. Similar to last year, the conference opened up with a video showing different employees from different positions at Bethesda — designers, artists, musicians, cooks, and more. Bethesda stressed how their employees all come from different backgrounds, countries and interests, and each hold different points of view. As with their employees, Bethesda is striving to make games as diverse as their players are. A sizzle reel was then shown of recent Bethesda games, such as Doom, Prey, and Fallout 4; alongside upcoming titles like Fallout 76 and Rage 2. Global Senior Vice President of Bethesda Pete Hines took the stage and stated that the theme of this conference is “create,” not just referring to the developers who create the games, but us, the players, who create our own stories and adventures within their worlds. 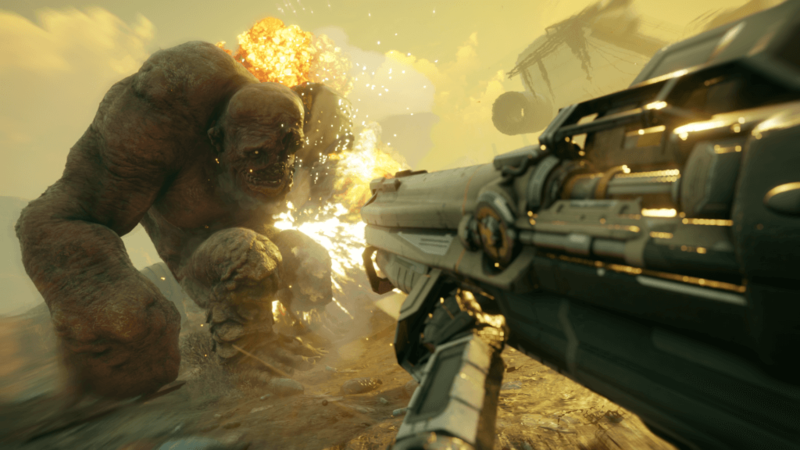 A developer from id Software and Avalanche came out to talk briefly about the Rage 2, stating that Avalanche was very excited to work with id, the studio that created the first-person shooter genre. It’s here we learned we’ll play as a character named Walker, and he is one of the last Rangers of the wasteland. A trailer started, talking about how an asteroid hit the planet and caused a near-extinction-level event, wiping out 80% of humanity. Many weapons and downright awesome abilities were shown, along with immense amounts of blood. Enemies are of various types, and many are vibrant and colorful; the game is gorgeous in every way. Specific details mentioned were a seamless open world, and if you see a vehicle, you can drive it. Vehicle combat seems to be a large part of the game, which is reminiscent of Mad Max. With all of this, plus huge mutant monsters to destroy, Rage 2 looks like it will be an awesome addition to the genre. No release date was mentioned. Next, the community manager for The Elder Scrolls: Legends arrived. He went on to mention how many people have played Legends, and how he thinks it’s currently the best card game for mobile devices. As for what’s to come for the game, players were promised brand new visuals, and it was revealed that Elder Scrolls: Legends will make its way to PlayStation 4, Xbox One, and Switch later this year. Right after a short trailer showcasing Elder Scrolls: Legends, Matt Firor of Zenimax Online Studios, game director of The Elder Scrolls Online, made his way out. He believes ESO has the best community in online gaming, and it was voted best MMORPG three years in a row, with over 11 million players. Coming next for ESO is dungeon-based DLC about werewolves called Wolfhunter, as well as the next big expansion, Murkmire, which takes place in the Black Marsh and deals with Argonians. A logo for Doom Eternal then filled the screen and developers came out to tell us how much they appreciate the support behind Doom. In Doom Eternal, they promised the Doom Slayer is more powerful and there are twice as many kinds of demons as the previous entry. They also hinted at seeing actual Hell on Earth, which makes sense based on the trailer. Gameplay will debut at QuakeCon this year in August. Speaking of QuakeCon, it’s time to talk Quake Champions. The speaker is talked about the legacy of Quake, and how it has been with eSports since the beginning, 20 years ago as the original eSports game. The teams behind Quake Champions are devoted to making the game fun for everyone. As of tonight, Quake Champions is available as a trial of the free-to-play version before it officially launches, and if players download and keep the game installed, they can play it even after the end of the trial period. The developers of Prey announce a free update will be rolling out tonight, including three new modes: Story Mode, New Game +, and Survival. Also, a brand new piece of DLC called Mooncrash is available right now. Mooncrash is a simulation-based mode where each experience is unique; enemies and loot are different each time you play. There is another expansion coming to Prey titled Typhon Hunter, which is a 1 vs 5 multiplayer mode designed as a lethal game of hide and seek. Five players are mimics, the game’s enemies, and disguise themselves as everyday objects while the solo player tries to find and eliminate them. Wolfenstein II is coming to Switch on June 29! Not to leave without giving us information on the next story in the saga, Wolfenstein: Youngblood — a story about the previous two games’ protagonist, B.J. Blazkowicz’ adult twin daughters — is announced. Youngblood will be co-op, as you are playing as the twins. A cinematic trailer was shown, showcasing the twins and showing us the new setting of the 1980s. Prey’s Typhon Hunter expansion will be available in VR, as will Wolfenstein, in some form. We’re getting to the main event, folks, as Pete brought out Todd Howard. Todd took the stage to the usual cheers, admitting that this is his 25-year anniversary working for Bethesda, while also reminiscing on the many different iterations of E3. A really fun spoof commercial played, featuring Keegan-Michael Key, featuring an Amazon Alexa-based version of Skyrim. Skyrim: Very Special Edition, also coming to Etch-a-Sketch, Motorola pagers, and Samsung refrigerators.This was a great poke at Bethesda themselves, and it was nice to see Todd Howard having fun with it. Okay, now we jump into Fallout 76 territory. Todd said almost word for word the few things he revealed when visiting the Microsoft conference, showing a sneak peek of the game: 76 is a prequel to all of the previous Fallout games, is four times bigger than Fallout 4, and is all about being one of the very first vault dwellers to emerge into a very different and untamed wasteland. Fallout 76 uses newly developed rendering, lighting, and landscape technology, and there are even different weather systems occurring across the massive map. You’ll explore six different regions across West Virginia as you complete the quest given to you by the Overseer: rebuild the world. All new enemies are showcased, and many of them are based on West Virginia’s own folklore and urban legends — some of them look like they came straight out of an Elder Scrolls game. Fallout 76 is entirely online and the easiest way to survive is by teaming up, but the game can also be played alone. Players can be whoever they want and can travel the open world as they please. When comparing it to other survival based games out there, Todd called Fallout 76 “soft-core survival.” Every person and character is real, and this is an idea developers at Bethesda just couldn’t shake. Combat looks just as you’d expect for a Fallout title, though no word on V.A.T.S. is given. Building is also a core part of the game, and now, unlike Fallout 4, you can build literally anywhere, and you can move your structures too. They decided to put multiple nuclear missiles in different spots of the map and let players do whatever they want with them. 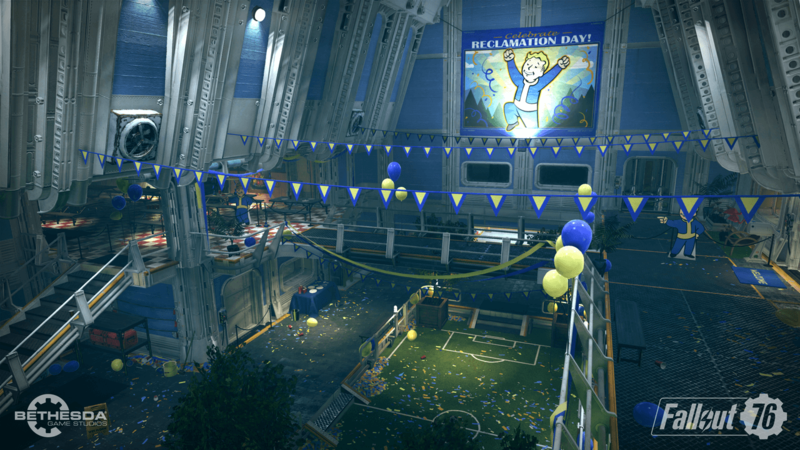 Fallout 76 will have 100% dedicated servers, and there will be a beta test coming. Howard briefly spoke on the collector’s edition of the game, which includes a glow in the dark map, figures to put on the map, and a wearable T-51 Power Armor helmet complete with voice modulation and a headlamp. Fallout 76: Power Armor Edition and the standard edition of the game will launch on November 14, 2018. That’s all from Fallout 76, but Todd isn’t quite finished. He speaks about Fallout Shelter, and how this year is the third anniversary of the game. Fallout Shelter is coming to PlayStation 4 and Switch. Tonight. Next on the docket, Elder Scrolls Blades, which is, at its heart, a pure Elder Scrolls game. A first-person Elder Scrolls adventure with console-quality graphics, it uses taps and timed swipes for combat, with the wide array of weapons and spells. Dungeons are a mix between handcrafted and procedurally generated. 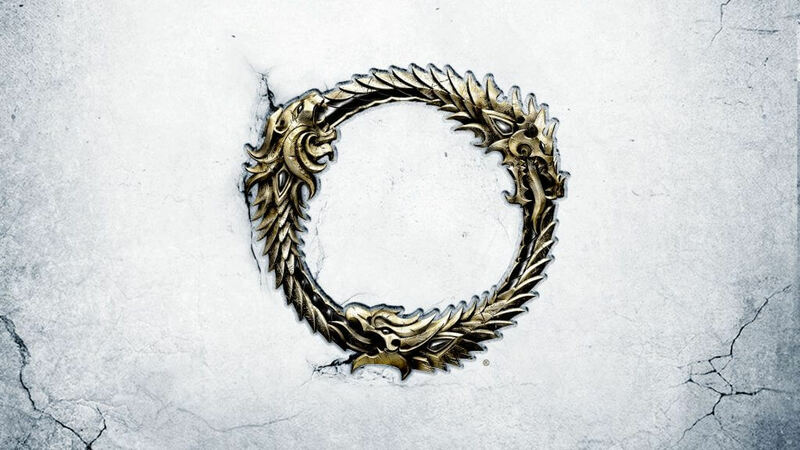 In true Elder Scrolls form, players will create their own characters and explore not only dungeons, but full outdoor areas as well, and will engage in several modes. The Abyss is a rogue experience in a never-ending dungeon, while Arena is 1 vs 1 combat against another real player. You also have The Town, which is where story elements will go down; you are a member of the legendary Blades, sworn to protect Tamriel and her people. Throughout The Town, you’ll be able to customize your town and level it up to bring in new NPCs. You can also visit friends’ towns or have them visit yours. Bethesda is working hard to put Elder Scrolls Blades on any platform they can — phones, tablets, computers, consoles, and even VR; all platforms will connect to each other. Elder Scrolls Blades is coming this Fall for free, and you can pre-register tonight on the Apple App Store or Google Play Store, or get a jump on things by visiting playblades.com. Todd decided it would be nice to do something they don’t usually do at these conferences and give a small glimpse at games coming out further in the future. He touts this first announcement as a brand new, next-gen, single-player game in an all-new franchise. This is the first wholly original Bethesda franchise in 25 years, Starfield. Howard notes that they have spent years just thinking about the game and working on it. He has one more thing to show us before he takes off. When the trailer starts, we are flying above the ground, but things are very foggy. We can make out that we are in a slightly mountainous region before the fog breaks and opens to a large world of valleys, fields, and a castle. Triumphant and familiar music blares in the background as the words fade into the foreground: The Elder Scrolls VI. No subtitle, no other information at all, and that was all we needed for hype to begin. Bethesda really knocked it out of the park with their showing. Even though Elder Scrolls Legends, Elder Scrolls Online, and Fallout Shelter aren’t for everyone, there was still more than plenty here to keep us excited until next year, and in the case of Starfield and The Elder Scrolls VI, for what may be a few years to come. For more on our E3 coverage, be sure to check out the rest of our conference recaps as well as pieces throughout the rest of gaming’s big week here on Geeks + Gamers.